Trauma to the maxillary incisors is a common situation and, it is extremely important to assess if dento-alveoler structures have been fractured immediately following the traumatic event. In cases where the tooth fragment has been recovered and stored in a recommended solution that prevent dehydration, reattachment of the fragment is one of the possible treatment plans. This case report presents the treatment of seven years old boy who had fractured his permanent maxillary central incisors during a skateboarding accident. Only one of the two fragments was available at the accident scene. The treatment plan involved reattachment of the fragment of tooth #8 and restoring the Class IV fracture site on tooth #9. Fragment reattachment can be a viable option in repairing fractured tooth structure following a traumatic experience. However, it is crucial that the operator understands the basic principle of adhesive bonding and the necessity for auxiliary retention features. If immediately following a traumatic event, the detached fragments is gathered and brought to the emergency room with the patient, the fragment reattachment should be considered one option for the treatment plan. Store the tooth fragment in an correct solution, apply an appropriate resin composite material and add a proper mechanical retention, may offer higher esthetic result, better bond strength and improved clinical longevity, compared with other types of restorative procedures. The dental-alveolar complex is frequently vulnerable to injury during sporting events or accidents . Unfortunately, this is a common situation that results in numerous emergency clinic visits across the United States. It has been reported that 25% of those injured are usually under the age of 18 . Immediately following the traumatic event, it is extremely important to assess if dento-alveoler structures has been fractured. If fractured, the detached fragments should be gathered and brought to the emergency room with the patient. A clinical examination with appropriate radiographs should be performed to evaluate pulpal or periapical involvement. Traumatic pulp exposure should be treated according to the nature and extent of the exposure. A decision should be made between endodontic therapy and a direct pulp cap, which has been demonstrated to be an efficient treatment method . In cases where the tooth fragment has been recovered and stored in a recommended solution, reattachment of the fragment is possibly. Tested and recommended solutions are: Hank’s Balanced Solution (HBSS), milk, egg white, hypertonic dextrose solution or saliva, water [4-8]. However, other treatments could be considered: class IV direct composite restoration, direct composite veneer, indirect ceramic veneer, post and cores, and indirect full prostheses. Fragment reattachment should be considered in order to preserve dental tissue, especially during active tooth development and apexogenesis in children . Recovering the same form, function, and estheticis advantageous in this situation . The benefits to the patient of reattachment of their tooth fragment include expedited treatment, lower cost, and a positive emotional experience [10-12]. Over the last decade, many adhesive materials and different reattachment techniques have been studied in order to improve the durability of the repair. External chamfer, beveling, over contour technique and an internal grove, are examples procedures that may improve the retention of the fragment [13-15]. 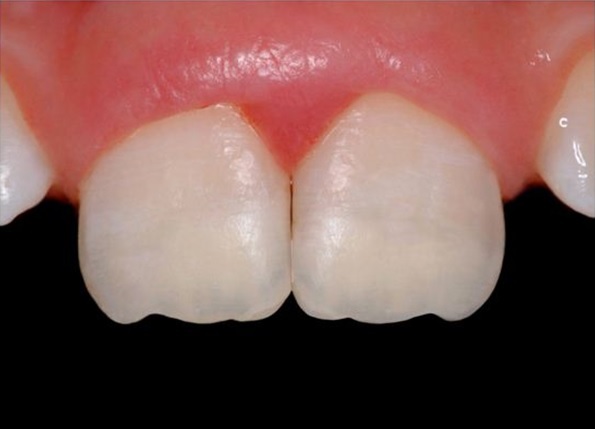 The purpose of this case presentation is to report a fragment reattachment technique following traumatic fracture of a central incisor on an child. A seven years old boy fractured his permanent maxillary central incisors during a skateboarding accident (Figure 1). The fragment of tooth #8 was available in the scene, which was stored in the patient’s saliva, and unfortunately the other fragment of tooth #9 was missing. In an emergency clinic, the dentist alleviated the acute symptoms and treated the fractures temporarily with calcium hydroxide and glass ionomer. On the same day, the patient and his mother presented to the dental clinic for a restorative consult to permanently repair the teeth. After clinical and radiographic evaluation, it was agreed to reattach the fragment of tooth #8 and to restore the Class IV on tooth #9. After reviewing the emergency treatment progress notes, it was noted that a direct pulp cap was placed on a small pulpal exposure on tooth #8, and no procedure was done on tooth #9. The vital direct pulp cap was done with the aim of maintaining pulp vitality. The materials of choice were, calcium hydroxide, (Dycal, DENTSPLY, York, USA) and a glass ionomer (VitrebondTM, 3M ESPE, St. Paul, USA) liner. Most part of the glass ionomer was removed with a spoon excavator on tooth #8 around the pulp cap to expose dentin for bonding purposes. An internal groove preparation of 1 mm depth (KG SORSEN, Sao Paulo, Brazil) was placed in the remaining tooth fragment with a small diamond bur #1012, (Figure 2) for the adaptation of the fragment with the remaining tooth structure. The fragment was positioned intra-orally to check the fit with the remaining tooth structure and it was noticed that neither dentin nor enamel was destroyed on the trauma. The decision was made to reattach the fragment found on tooth #8 and to restore the class IV presented on tooth #9. 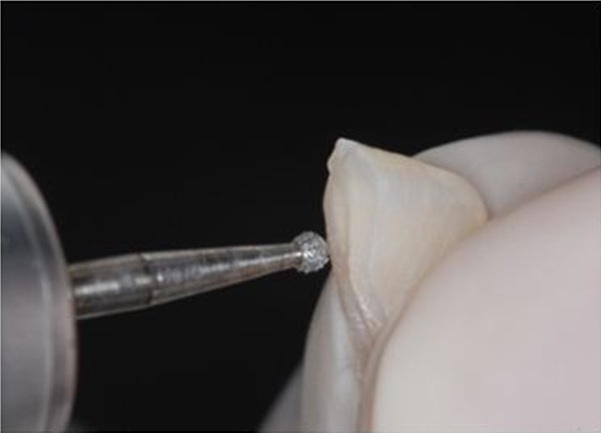 The internal groove preparation of 1 mm depth that was placed in the remaining tooth fragment of tooth #8 (Figure 2) provided the additional retention necessary to increases the micromechanical retention of the resin composite and adhesive bonding agent. No internal groove was done in the tooth, due to the proximity with the pulp. With the fragment in position, an increment of resin composite (Universal Dentin Shade; FiltekTM Z250, 3M ESPE, St. Paul, USA) was placed over the tooth and the fragment to hold them in position and light-cured. A green stick compound (Impression compound, Kerr ITALIA, Scafati, Italia) was melted and placed over the adjacent teeth and the fragment in order to create a guide for a correct path of insertion during the reattachment procedure (Figure 3). After the compound cooled, the increment of resin composite was removed. The compound and tooth fragment were separated from the remaining teeth and verified several times as an index guide. While restoring tooth #8, the adjacent teeth were protected with a Mylar-strip (Matrix Tape, 3M ESPE, St. Paul, USA) during the tooth conditioning procedure. The tooth and the fragment were etched with 37% phosphoric acid (ScotchbondTM etchant, 3M ESPE, St. Paul, USA) for 15 seconds and after, rinsed with water for 15 seconds. The excess water was removed with absorbent paper. Primer (Adper Scotchbond multi-purpose primer, 3M ESPE, St. Paul, USA) was applied to the etched enamel and dentin and air-dried gently for 5 seconds. The adhesive (Adper Scotchbond multi-purpose adhesive, 3M ESPE, St. Paul, USA) was applied to the primed enamel and dentin, which penetrates in the tubules of the dentin in order to create a hybrid layer. The adhesive was light cured for 10 seconds with a QTH light-cure unit (Optilux 500, KEER, Orange, CA, EUA). A small amount of resin composite universal dentin shade (FiltekTM Z250, 3M ESPE, St. Paul, USA) was placed on the tooth before the compound with the tooth fragment was indexed (Figure 4). The excess resin composite was removed with a plastic instrument prior to polymerization. The resin composite was polymerized for 20 seconds with a QTH light-cure unit (Optilux 500, KEER, Orange, CA, EUA), finished with serial finishing burs (KG SORSEN, Sao Paulo, Brazil) and polished with sandpaper disks (Diamond Pro, FGM, Joinville, Brazil) for the final fragment reattachment procedure (Figure 5). During the restorative process of tooth #9, the preparation of the tooth structure was the same of tooth #8. The phosphoric acid, primer and bonding agent were used according the manufacturer’s recommendation. A Palatal guide was made using an impression material (ExpressTM VPS, 3M ESPE, St. Paul, USA) from a diagnostic wax-up for the resin composite restoration of #9. The first layer of resin composite placed was the lingual wall with A1 shade (FiltekTM Z250, 3M ESPE, St. Paul, USA). The dentin was reproduced with universal dentin shade (FiltekTM Z250, 3M ESPE, St. Paul, USA), and the final resin composite layer was A2 shade (FiltekTM Z250, 3M ESPE, St. Paul, USA). Each layer of resin composite was polymerized for 20 seconds with a QTH light-cure unit (Optilux 500, KEER, Orange, CA, EUA). The external surfaces were finished with serial finishing burs FG 2134, FG 2134 F, FG 2134FF (KG SORSEN, Sao Paulo, Brazil) and polished with sandpaper disks (Diamond Pro, FGM, Joinville, Brazil) (Figure 6). Proximal contacts were verified for both restorations using floss (Colgate Total® floss, Colgate, New York, USA) and occlusal contacts were marked with double-sided articulating film (AccuFilm® II, Parkell, Edgewood, USA). All excursive movements were verified and postoperative instructions provided. 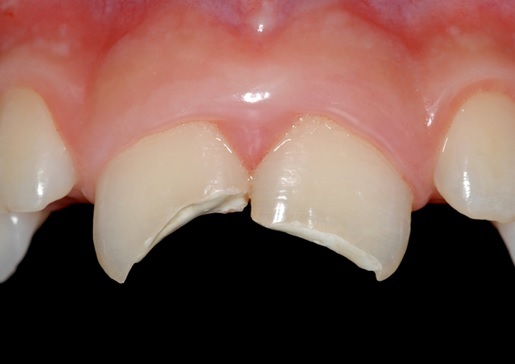 The patient was placed on 6 and 12 months recall monitoring the direct pulp cap and too evaluating the stability of the reattached tooth fragment. The follow-up period showed positive tooth vitality on cold testing using ethyl Chloride Spray (Endo Ice, Coltene Whaledent, USA). Follow-up radiographs were normal without any evidence of periapical pathology. 1. Locate and bring the broken piece/s to the emergency room or dental office. 2. Transport the fragment in an appropriate solution: Hank’s Balanced Solution (HBSS), milk, egg white, hypertonic dextrose solution or saliva, water [4-8]. If these solutions are not available, store the fragment in the patient’s saliva . Pulpal protection is paramount in these acute traumatic situations. An indirect pulp capping procedure is indicated if the fracture approaches the pulp, but no exposure occurs. A root canal treatment or a direct pulp cap is indicated if the pulp tissue is exposed. Direct pulp capping with calcium hydroxide or MTA has been shown to be controversial . On the other hand, some authors believe that direct pulp capping has clinical merit and should be considered as a non-aggressive alternative to root canal treatment [18,19]. Following adequate pulpal protection of fractured teeth, the operator should turn to replacing form, function, and esthetics. Many restorative treatments can be performed: fragment reattachment, class IV direct composite restoration, and direct composite veneer, indirect ceramic veneer, post/cores and indirect full coverage crowns. Fragment reattachment has advantages for the patient to consider. Recovering the same form, function, and esthetic is advantageous in this situation . The positive psychological effects for the patient who accepts their own tooth fragment for reattachment,  in combination with a reduced and time commitment, [10,11] can be used to guide the patient’s decision in treatment options. In this case report, the decision was made to perform fragment reattachment with adhesive bonding following consent from the patient, parents, and operator. The adhesive bond strength of the reattachment fragment is lower when compared with an unbroken tooth and a 50% failure rate after 2-3 years is due to a new trauma [20,21]. However, material selection to reattach the fragment 13 and additional retention form are important factors for successful treatment. A nano-filled resin composite was chosen for its polish ability, color stability, color characteristics, and wear resistance . Additional retention was placed which increases the micromechanical retention of the resin composite and adhesive bonding agent. Some retention features available for fragment reattachment are an external chamfer, beveling, over contour technique, and internal grove [14,15]. An internal groove was the mechanical retention elected in this clinical case because it preserves the enamel for adhesive attachment. 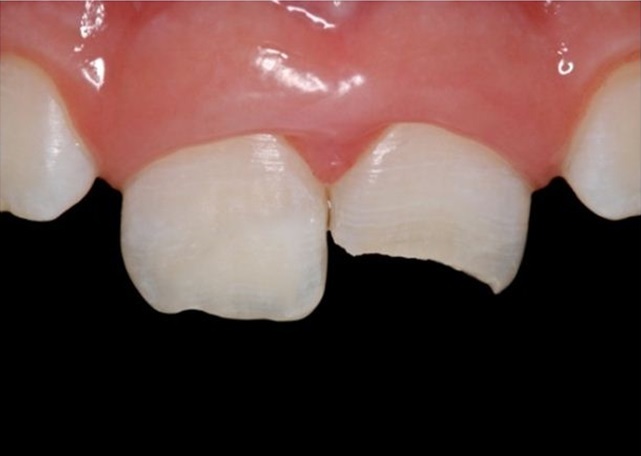 The fragment reattachment is a procedure that depends heavily on the depth of dentin hybridization. Auxiliary retention features are paramount to augment the micromechanical adhesive bonding provided with in the hydroxyapatite and dentinal collagen. Fragment reattachment can be a viable option in repairing fractured tooth structure following a traumatic experience. Uddin MF, Naser M, Howlader MMR, Alam MS, Nabi MN (2012) Changing Concepts in Reattachment of Tooth Fracture. Update Dental College Journal 2: 42-46. 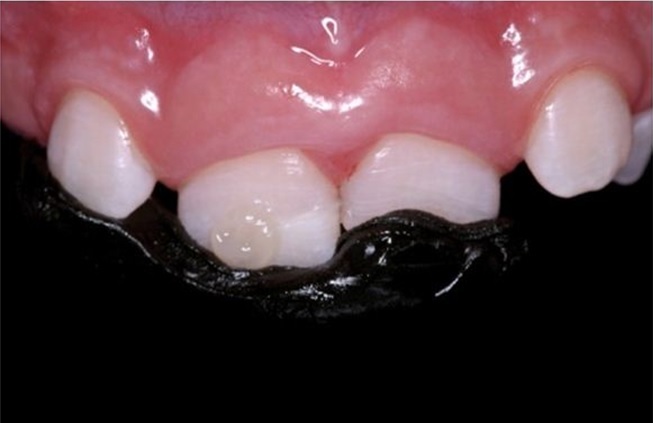 Macedo GV, Diaz PI, De O Fernandes CA, Ritter AV (2008) Reattachment of anterior teeth fragments: a conservative approach. J Esthet Restor Dent 20: 5-18. Yalcin M, Arslan U, Dundar A (2014) Evaluation of antibacterial effects of pulp capping agents with direct contact test method. Eur J Dent 8: 95-99. Sigalas E, Regan JD, Kramer PR, Witherspoon DE, Opperman LA (2004) Survival of human periodontal ligament cells in media proposed for transport of avulsed teeth. Dent Traumatol 20: 21-28. Marino TG, West LA, Liewehr FR, Mailhot JM, Buxton TB, et al. (2000) Determination of periodontal ligament cell viability in long shelf-life milk. J Endod 26: 699-702. Khademi AA, Atbaee A, Razavi SM, Shabanian M (2008) Periodontal healing of replanted dog teeth stored in milk and egg albumen. Dent Traumatol 24: 510-514. Shirani F, Sakhaei Manesh V, Malekipour MR (2013) Preservation of coronal tooth fragments prior to reattachment. Aust Dent J 58: 321-325. Shirani F, Malekipour MR, Manesh VS, Aghaei F (2012) Hydration and dehydration periods of crown fragments prior to reattachment. Oper Dent 37: 501-508. Palma-Dibb RG, Taba M (2004) Autogenous tooth fragment reattachment--association of periodontal surgery and endodontic and restorative procedures: a case report. Quintessence Int 35: 179-184. Yilmaz Y, Guler C, Sahin H, Eyuboglu O (2010) Evaluation of tooth-fragment reattachment: a clinical and laboratory study. Dent Traumatol 26: 308-314. Chazine M, Sedda M, Ounsi HF, Paragliola R, Ferrari M, et al. (2011) Evaluation of the fracture resistance of reattached incisal fragments using different materials and techniques. Dent Traumatol 27: 15-18. Nogueira Filho Gda R, Machion L, Teixeira FB, Pimenta LA, Sallum EA (2002) Reattachment of an autogenous tooth fragment in a fracture with biologic width violation: a case report. Quintessence Int 33: 181-184. Reis A, Kraul A, Francci C, de Assis TG, Crivelli DD, et al. (2002) Re-attachment of anterior fractured teeth: fracture strength using different materials. Oper Dent 27: 621-627. Abdulkhayum A, Munjal S, Babaji P, Chaurasia VR, Munjal S, et al. (2014) In-vitro Evaluation of Fracture Strength Recovery of Reattached Anterior Fractured Tooth Fragment Using Different Re-Attachment Techniques. J Clin Diagn Res 8: 208-211. Vijayaprabha K, Marwah N, Dutta S (2012) A biological approach to crown fracture: Fracture reattachment: A report of two cases. Contemp Clin Dent 3: 194-198. Fidel SR, Fidel-Junior RA, Sassone LM, Murad CF, Fidel RA (2011) Clinical management of a complicated crown-root fracture: a case report. Braz Dent J 22: 258-262. Shirani F, Malekipour MR, Tahririan D, Sakhaei Manesh V (2011) Effect of storage environment on the bond strength of reattachment of crown fragments to fractured teeth. J Conserv Dent 14: 269-272. Mente J, Hufnagel S, Leo M, Michel A, Gehrig H, et al. (2014) Treatment outcome of mineral trioxide aggregate or calcium hydroxide direct pulp capping: long-term results. J Endod 40: 1746-1751. Willershausen B, Willershausen I, Ross A, Velikonja S, Kasaj A, et al. (2011) Retrospective study on direct pulp capping with calcium hydroxide. Quintessence Int 42: 165-171. Badami AA, Dunne SM, Scheer B (1995) An in vitro investigation into the shear bond strengths of two dentine-bonding agents used in the reattachment of incisal edge fragments. Endod Dent Traumatol 11: 129-135. Munksgaard EC, Højtved L, Jørgensen EH, Andreasen JO, Andreasen FM (1991) Enamel-dentin crown fractures bonded with various bonding agents. Endod Dent Traumatol 7: 73-77. Cao L, Zhao X, Gong X, Zhao S (2013) An in vitro investigation of wear resistance and hardness of composite resins. Int J Clin Exp Med 6: 423-430. Figure 1: Coronal fracture of maxillary central incisors involving enamel and dentin. 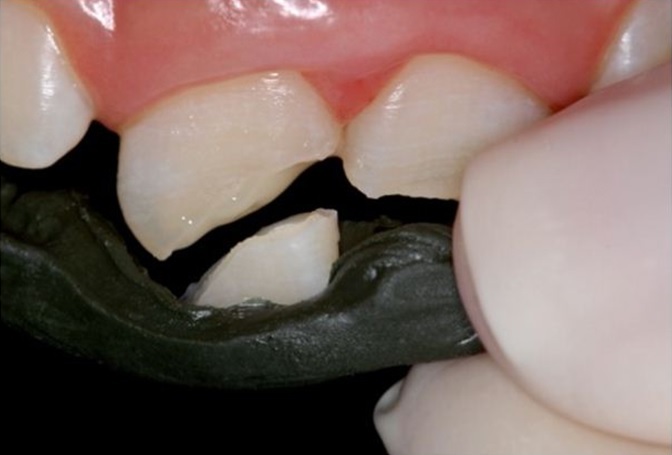 Figure 3: Green compound over adjacent teeth and the fragment to create a correct path of insertion. Figure 4: Resin composite on the tooth prior to placing the fragment, and compound guide used to position fragment. Figure 5: Fragment reattachment completed. Figure 6: Clinical view after the fragment reattachment on #8 and composite restoration on #9. Citation: Durski MT, Metz MJ, Crim GA (2016) Tooth Fragment Reattachment and a Class IV Restoration: Case Report. J Dent Oral Health Cosmesis 1: 002.